The Virginia basketball team overcame a slow start and an uncharacteristically shaky day on defense Thursday to pick up a Thanksgiving Day victory. The Cavaliers countered blow after blow from an upset-minded Dayton team to pull out a 66-59 win in the Battle 4 Atlantis Semifinals. The tournament championship will be decided between UVA and Wisconsin on Friday at 2 p.m. The Hoos fell behind early as they struggled to knock down shots. They opened 0-of-7 shooting while the Flyers built a 7-0 lead in the first five minutes. Kyle Guy finally broke the ice at the 15:04 mark with a 3-pointer, but it took nearly the whole first half for the Cavaliers to take the lead and keep it. Virginia forward De’Andre Hunter put his team in front for the first time on a rebound basket at the 5:58 mark that made it 18-17. The game was still tied at 20-20 near the two-minute mark when another Hunter stickback finally sparked a short run that gave the Wahoos the lead for good, though the margin stayed in single digits throughout. Those two offensive rebounds were part of another big day overall for Hunter. He led all scorers and matched his career high with 23 points. That total came efficiently as Hunter made 8 of 11 shots and 6 of 6 free throws. He also tallied 6 rebounds, 1 assist, and 1 steal. The sophomore also iced the game for good with a shot-clock beating 3-pointer in the final minute that pushed the lead out to seven points. On that play, he faked a shot and let the first defender fly by before hitting a pull-up jumper over the next rotating defender just ahead of the shot clock. Hunter said he saw the shot clock while taking the dribble and then instincts took over from there. Overall, with two big games in the Bahamas, he said he’s just trying to be assertive. 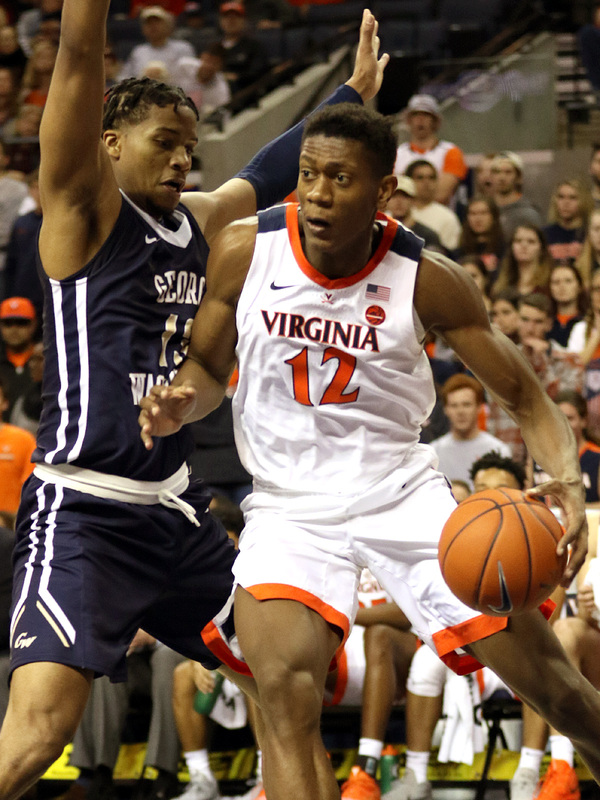 Guy and Jerome showed off their shooting skills with two 3-pointers each in the win, but they needed more from their bag of tricks to help UVA get the win Thursday. Jerome went scoreless in the first half and made just 3 of 10 shots overall, but he got himself into the paint with drives and that led to repeated free throw chances. He made 7 of 10 shots at the charity stripe and that helped push him to 15 points in the second half. Guy, meanwhile, hit 5 of 11 shots in the game and made both of his free throw attempts to score 14 points. The eye-catching play of the second half in his case, however, came in the final four minutes during Virginia’s game-clinching surge. Guy jumped up from a crowd, grabbed an offensive board, and scored the bucket to put his team ahead 60-52 at the time. That’s just the 13th putback of his career. The Hoos also got 9 points, 5 rebounds, and 2 assists from Kihei Clark as they went to a small ball lineup of Clark, Guy, Jerome, Hunter, and Braxton Key for most of the game. Guy’s offensive rebound came with that lineup on the floor. “That was a heck of an offensive rebound by Kyle and putback and we needed it all,” Bennett said. The Cavaliers needed all the points they could get because they had more breakdowns than normal defensively. Dayton shot 54.3% (25-46) in the game and it wasn’t like one half tilted the numbers. The Flyers hit better than 50% in both halves. They scored 36 points in the paint to help boost those shooting numbers. Josh Cunningham led the way with 15 points on 6-of-8 shooting, while Obi Toppin posted 13 points on 6-of-7 shooting. Jalen Crutcher added 11 on 4-of-9 shooting. Dayton used high ball screens and some quick ball movement action into drives or ball screens to create cracks in the defense. The driving lanes usually sealed up by UVA’s defense saw some openings in this one and that led to high percentage shots that the Flyers put down. Fortunately for the Hoos, they shook off their slow start and answered with a strong set of offensive numbers too. After going 0-7 early, UVA finished the first half making 10 of its final 20 shots. That carried over to the second half where Virginia made 11 of 22 shots. The Cavaliers also made regular trips to the free throw line where they made 17 of 22 attempts. All of that was enough to set up a title game matchup with Wisconsin.